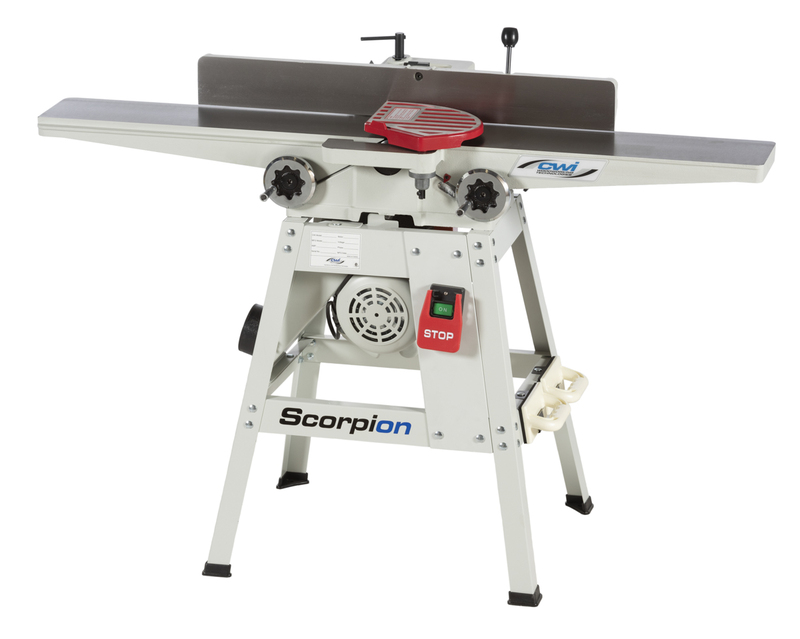 The Scorpion CWI-J075 is a very high quality 6” width long bed jointer built for the demanding hobby user looking for the features and performance of more expensive machinery but in an affordable frame. Literally the CWI-J075 is the same machine as our CWI-J100 but with a more simplistic four legged stand. The 56” x 7.25” machined cast iron bed is one of the longest in the industry and is easily adjustable for flatness by the machined dovetail ways and locking adjustment screws. 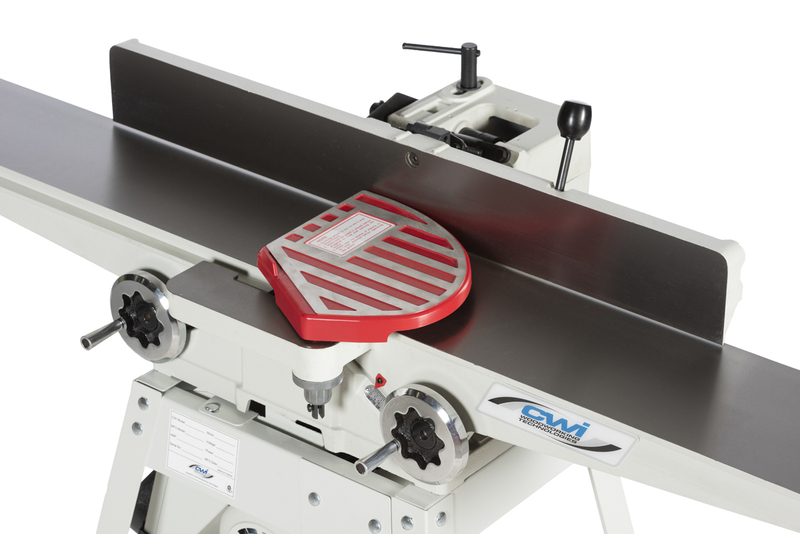 When using a jointer, having the longest table length possible is preferred to help when machining longer boards to give more work piece support and less chance of “cupping” or curving the long boards. Other than the table length one of the most impressive features of the Scorpion jointers is the front facing hand wheels for the adjustment of the table heights on both infeed and outfeed tables. Most jointers use hand wheels or levers located underneath the tables which can be awkward to reach or difficult to adjust. The Scorpion hand wheels are easily reached at the front of the machine and allow for precise adjustments of the bed heights. There is also a set stop at 1/8” depth of cut but simply pull the stop pin to adjust the table height for up to ½” of cut. 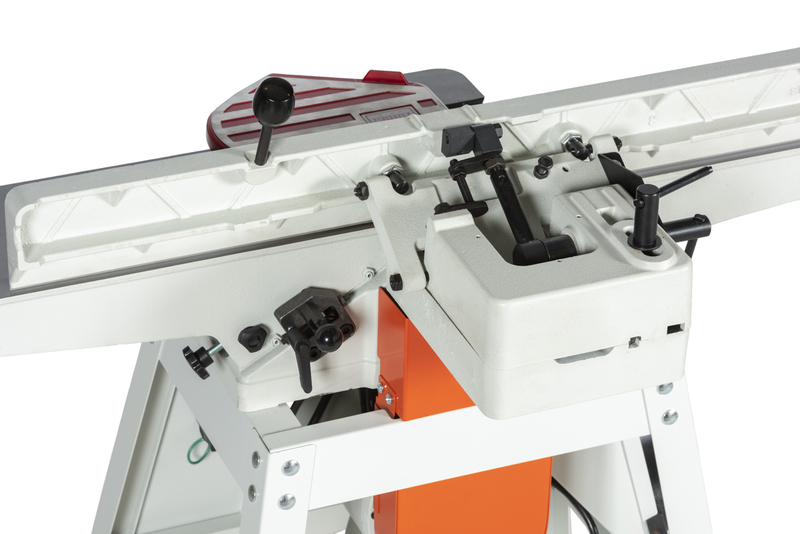 The outfeed table height is also adjustable for ensuring correct knife height to the table surface. The robust cast iron machined fence is 4” tall and an amazing 29” long for excellent work piece support as it travels the length of the jointer bed. The fence has set stops at 135 degrees, 90 degrees and 45 degrees and as well can be set anywhere in between for angle work. It is supported by a massive cast iron fence mechanism to allow accurate and simple adjustments for both angles and width of cut. 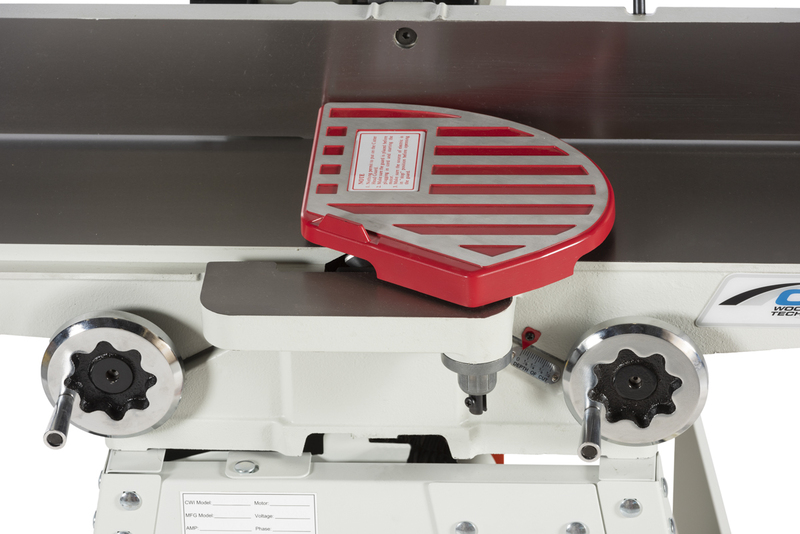 The J075 has a powerful 14 amp (7 amp on 220 volt) 1 HP motor and easy stop paddle switch which drives the 2.5” diameter 3 knife cutter head at 5000 rpm. The four legged stand bolts together securely for excellent support and features a dust chute with 4” dust port for hook up to dust collection. The Scorpion CWI-J075 is also available with an optional Stinger 5 row carbide helical cutter head with 30 – 15mm x 15mm x 2.5mm four sided convex edge knives for extreme cutting performance.